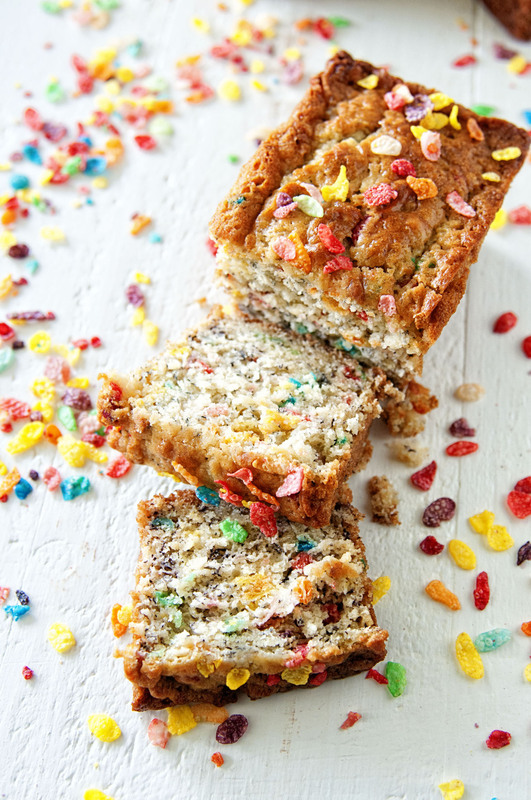 Fruity Pebble Banana Bread: Two breakfast treats in one bread. 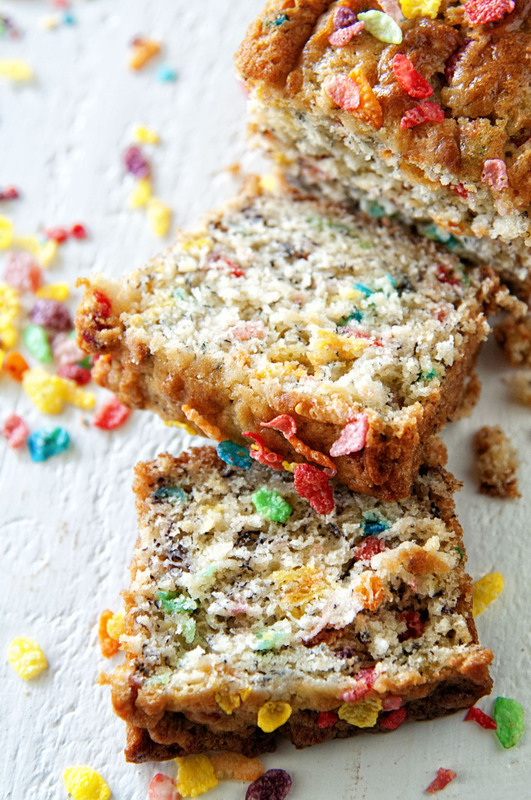 Moist banana bread studded with Fruity Pebbles cereal. Don’t even need milk. This certainly is not the first time I’ve put cereal in a breakfast food. But for whatever reason banana bread with Fruity Pebbles sounded good to me. Just like every recipe I decide to make…I had almost every other cereal except for Fruity Pebbles at the house. Every time I post a variation of this bread someone asks if I meant to have a TABLESPOON of baking powder. It’s best to use full fat buttermilk. I am lucky and have a local place that has it. If you don’t have full fat buttermilk I would use full fat sour cream instead over using lower fat buttermilk. It will be the same measurement, they are interchangeable in this recipe. You can also use full fat greek yogurt as well. Make this is a full size pan, mini loaves (as I did here), or even as muffins. All will work fine. I just prefer mini loaves to give away to people. You could try this with other cereal…I think cocoa Krispies would work really well with this recipe as well. I would keep it to that size cereal. I don’t think a really large cereal would work unless you crushed it. 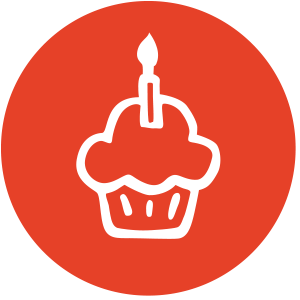 Hopefully I’ll be back to baking more. March has been a blur of vet visits. 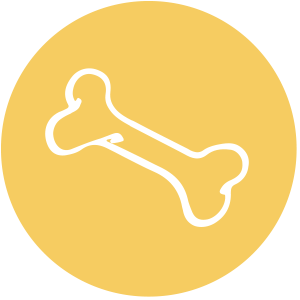 Cardiology appointments for both dogs and humans. My husband has a follow up tomorrow. We are hoping for good news. I was bummed most of last week as it was the anniversary of Crazy Cocker Spaniels death as well as Hawking passing. Which if you are not a long time reader most of you don’t know that I have advanced degrees in astrophysics all due to being inspired by Stephen Hawking. Next week is a special Easter week where there will be giveaways so be on the lookout for that. Grease and flour a 9-x-5-3-inch loaf pan, or three mini loafs, or 16 muffin cups. 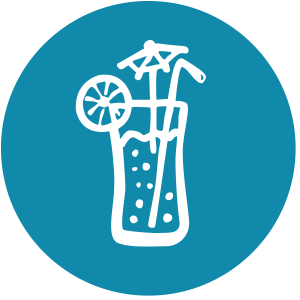 Slowly add the sugar, 1 TBSP at a time, beating continuously on high speed. It should take 5 to 10 minutes to add the sugar. 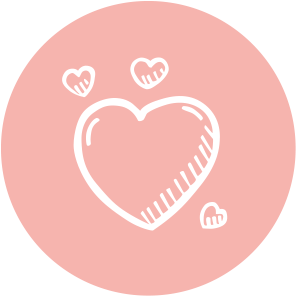 The mixture should be light, fluffy and creamy white in color. Add one third of the flour mixture to the batter and beat until it is just incorporated. Add one third of the buttermilk and mix until just incorporated. Add the flour and buttermilk in two more additions, mixing until addition is incorporated before adding the next. Fold in the bananas and Fruity Pebbles. Bake for 1 hour and 15 minutes for large loaf, thirty minutes for mini loafs and 22-24 minutes for muffins. Serve warm or at room temperature. Will keep for one week in fridge or 3 weeks in freezer. Wow! You just made my dreams come true!! 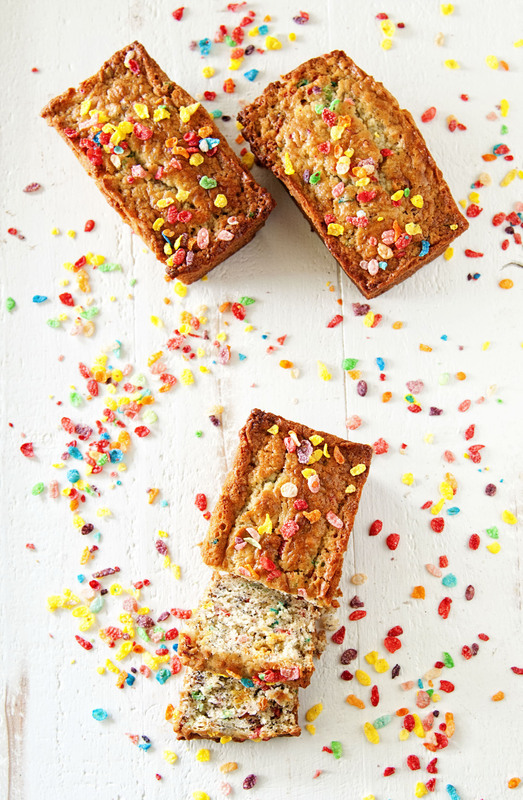 I 💛banana bread and I 💛Fruity Pebbles!